Dipping into the mailbag today to answer a few questions. If you’ve got something on your mind, send it my way. You can easily click here to ask away.Here’s a good one from Rose talking about the new 10 Handstand Mistakes report. Where you bend your back will be dependent on you. Yes you have to experience it but you can learn a lot from looking at pictures and of course watching video. Most of the bend is in the low back, and personally I feel like I get ‘locked in’ to the right position whenever I do a handstand. Keep at it and you’ll get the feel. As for the hands, there is much you can do with them. Honestly any position you take with your hands is doable for the handstand, whether its on the fists, hands backwards, or just the thumbs. But the standard position is hands flat on the ground with either the middle or index fingers pointing forward. Work on this position first and foremost until you have build up your balancing ability. Once you have a decent handstand feel free to mix up your hand positions. Professor Orlick gives you 25 different hand positions and 10 different finger positions to work on it Hand Balancing Made Easy. Many of these I had never even though about trying.And here’s one from Aldy. The secret? Alright you asked so I am going to give it to you. The secret is…You have to work up to it progressively. First off, congratulations on doing the planche. That is a move few can do. But there is a big difference in the planche and the one hand handstand. One requires more strength while the other requires much more balance. And you have to be progressive in your balance training. Jim Bathurst and I talked at length about this in the interview for the Hand Balancing Mastery Course. Basically you are going to have to train a bit differently for each. Just like you would train the free standing handstand and handstand pushups against the wall differently you should do the same here. And like the normal handstand, the way I teach it, you have to work on a series of lead up stunts that will give you the ability to balance on one hand. There are many helpful variations that lead up to the one hand handstand. 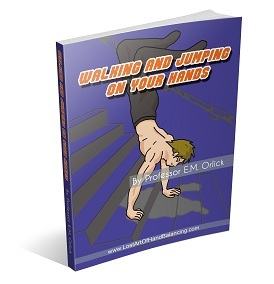 Professor Orlick lays them all out in as easy to use manner in How to do the One Hand Handstand. I am working on my own plan, exactly what is working for me, but details on that another time. Since this is already running long I’ll have to save more for next time. P.S. If you want to get all of Professor Orlick’s works plus the interview with Jim and more than click here.